I can't believe that it is the end of May already. Seriously, where has this year gone? It's truly crazy. Anyway, today I am back with another Femme Fatale post - the releases from this month. There was actually three polishes released this month, a Colour Of The Month (which I posted about here) and two oops shades which I'll be showing you today. 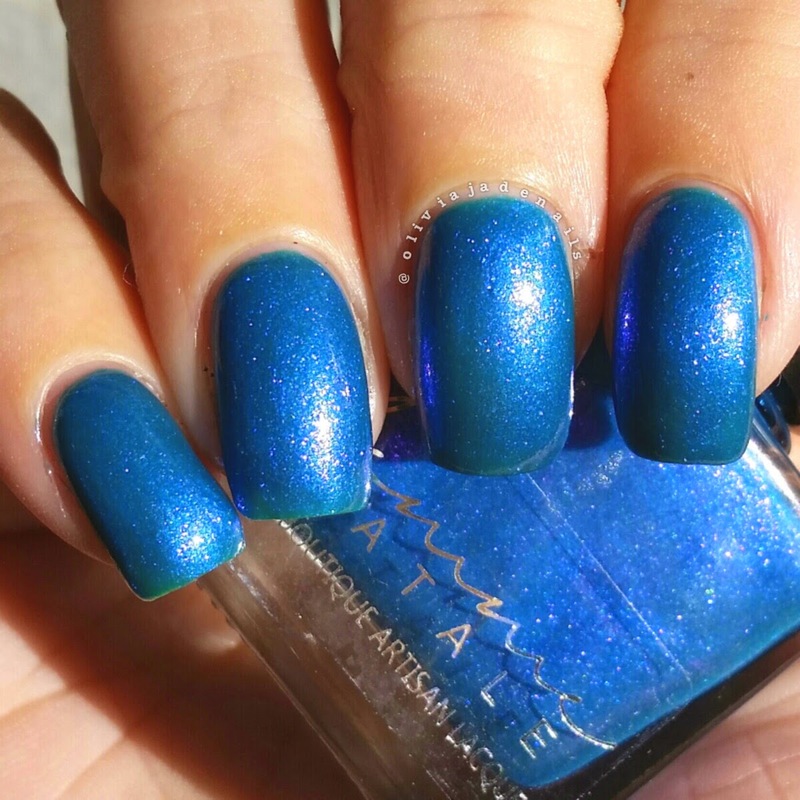 Crystal Skull is described as having a deep teal-blue base, strong golden shimmers and flacks, slight holo and a ton of silver holo micro glitter. Really pretty and applies easily (although my brush is rather dodgy) and is opaque in two coats. 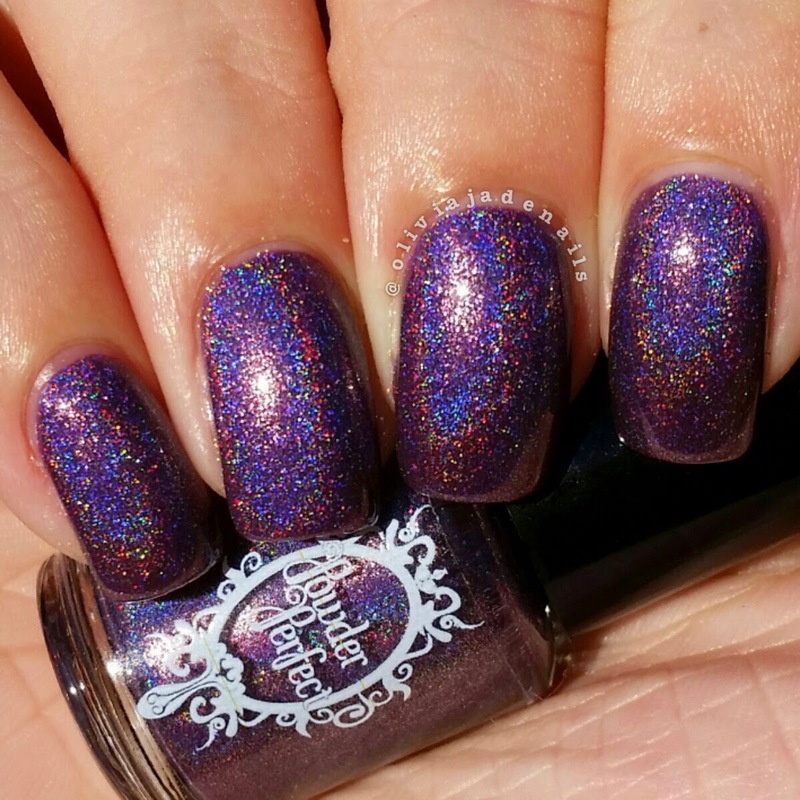 Peachick is described as a rich velvety purple base with soft green shimmers and fuschia highlights with purple holo. 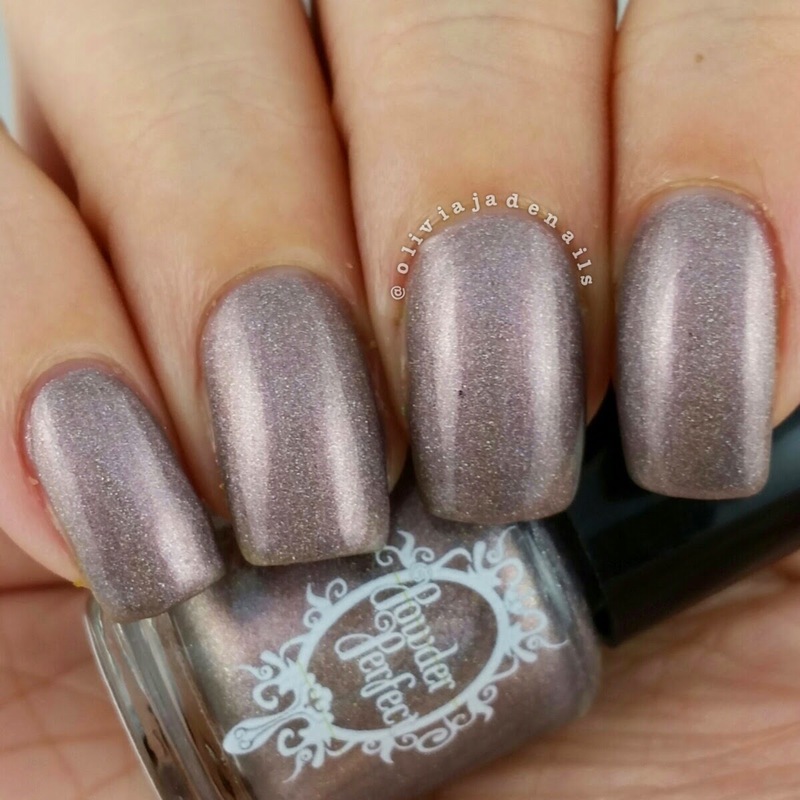 I love this one and really have no idea why it's an oops shade. It applies easily and only requires two coats to be opaque. I am so happy that I have these in my collection. 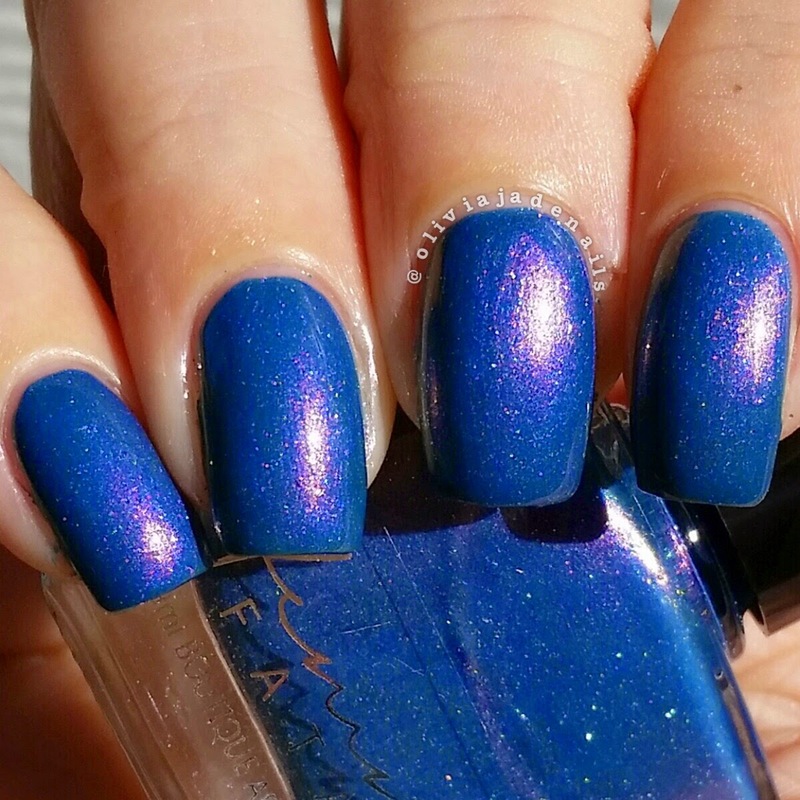 It's always such a relief to get hold of my beloved Femme Fatale polishes, and they are always worth the stress and frustration of getting them. Speaking of which, who is going to be trying to grab the June releases? You can bet I will be there. I have decided that today will be my last Flakie Friday....for now. I'm sure they will be back in the future or just completely randomly. Why you may wonder. Well as I was unpacking my many, many polishes from the move I was overwhelmed by how many beautiful polishes I have sitting in my drawers that I am still yet to wear. It's so sad. So that will be changing. Be prepared for lots of random swatch spam coming. 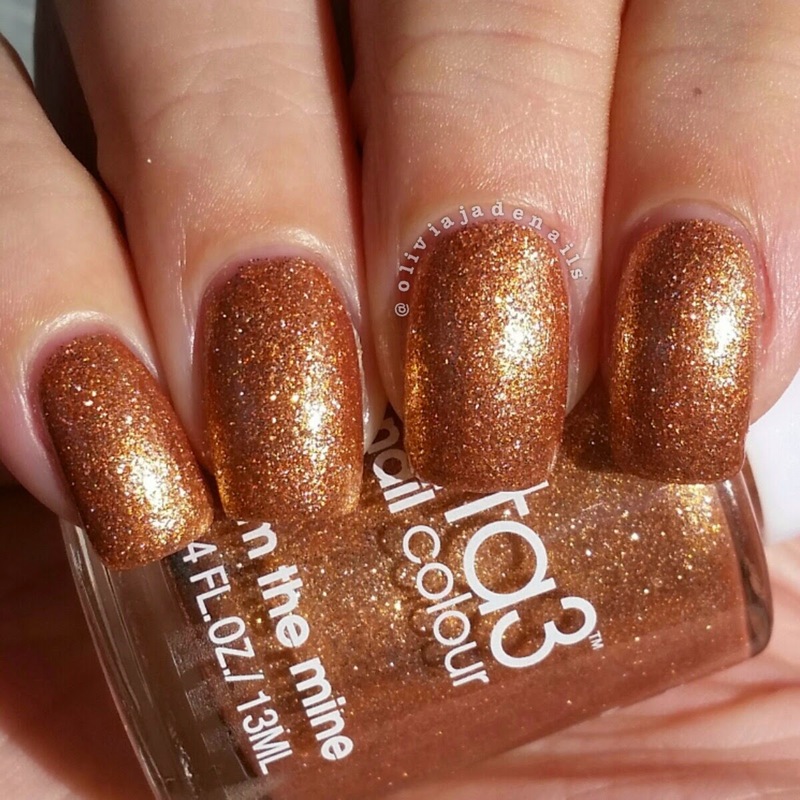 For today's Flakie Friday I decided to pull out the newest flakie in my collection - Femme Fatale's Pyramid's On Mars. 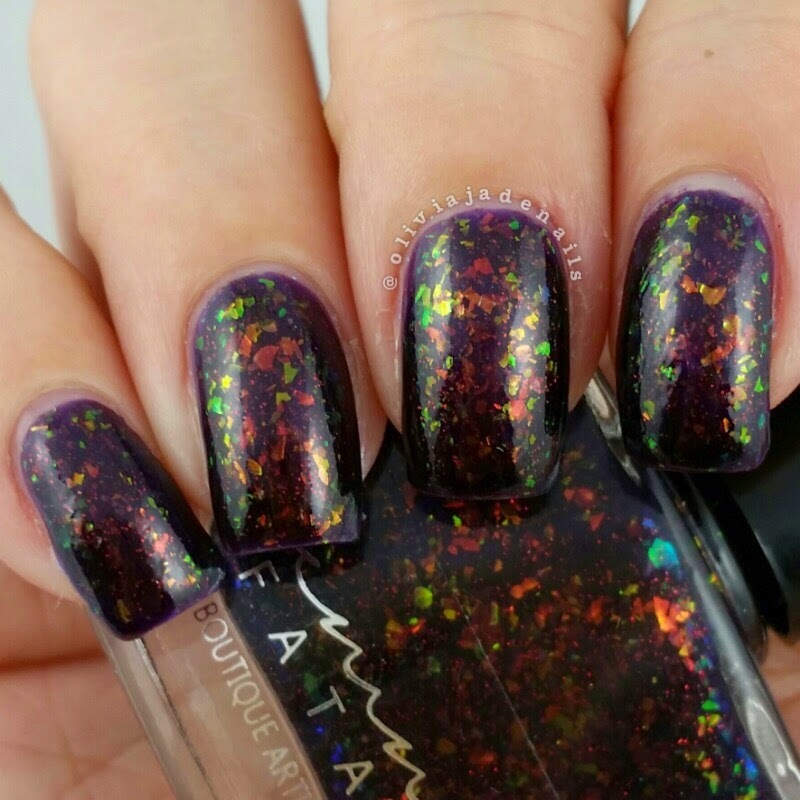 This polish is a deep purple jelly with orange/gold/green/blue flakies and red shimmer and is this months Colour Of The Month. I absolutely love this polish. Super easy to use and looks so stunning. Pictures really just don't do it justice. I used two coats for my swatch. Soooooo pretty. I'm really looking forward to trying the other releases from May. I plan on doing that over the weekend so fingers crossed I can. Nothing like having new pretties to play with. What have you got planned for the weekend? I'm back with another Powder Perfect collabation. This time, Powder Perfect has teamed up with Live Love Polish and has created the Romance Of Nature Collection. This limited edition collection consists on six polishes and I am excited to share with you five of the polishes. The formula of these polishes are all fantastic. They apply like a dream and are opaque in two coats which is what I have used for all of my swatches. 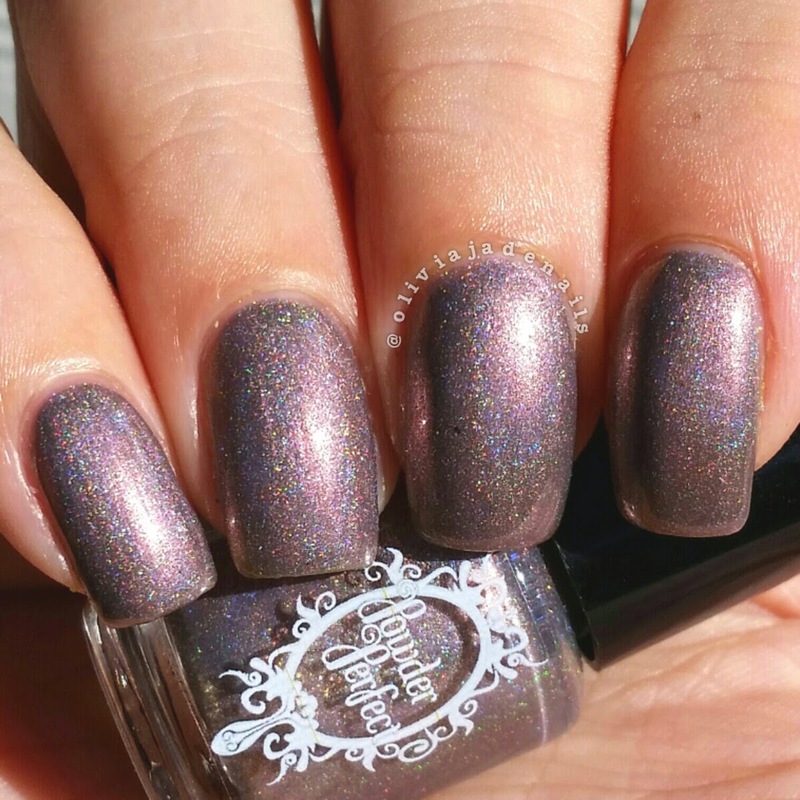 Beneath The Moon is described as a romantic dusty pink scattered holographic polish. Such a beautiful colour. 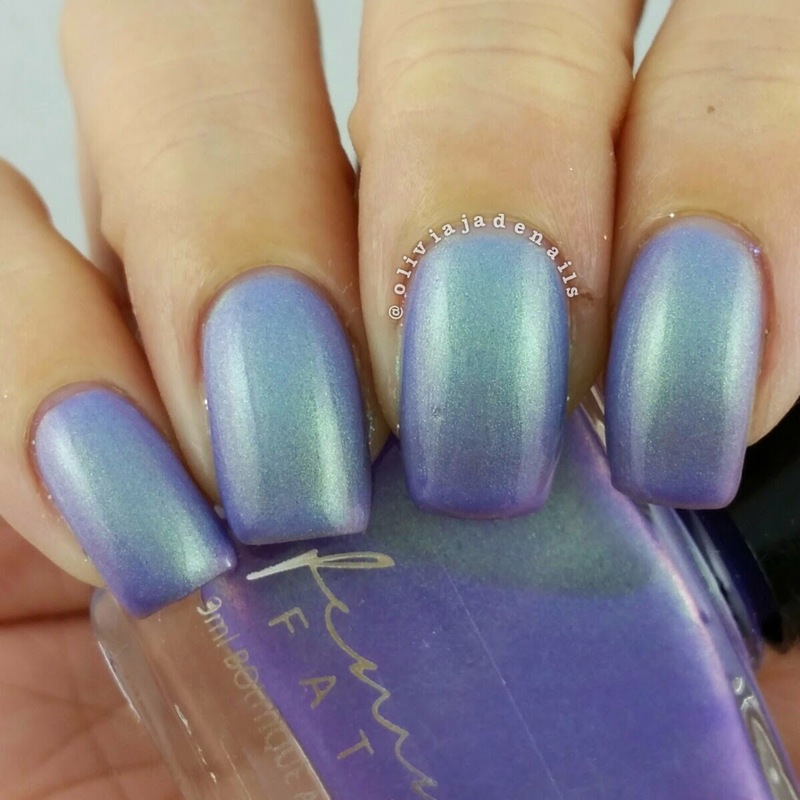 Equinox is described as a pearlescent holographic polish with a pale rosy lilac base. I am in love with this polish. 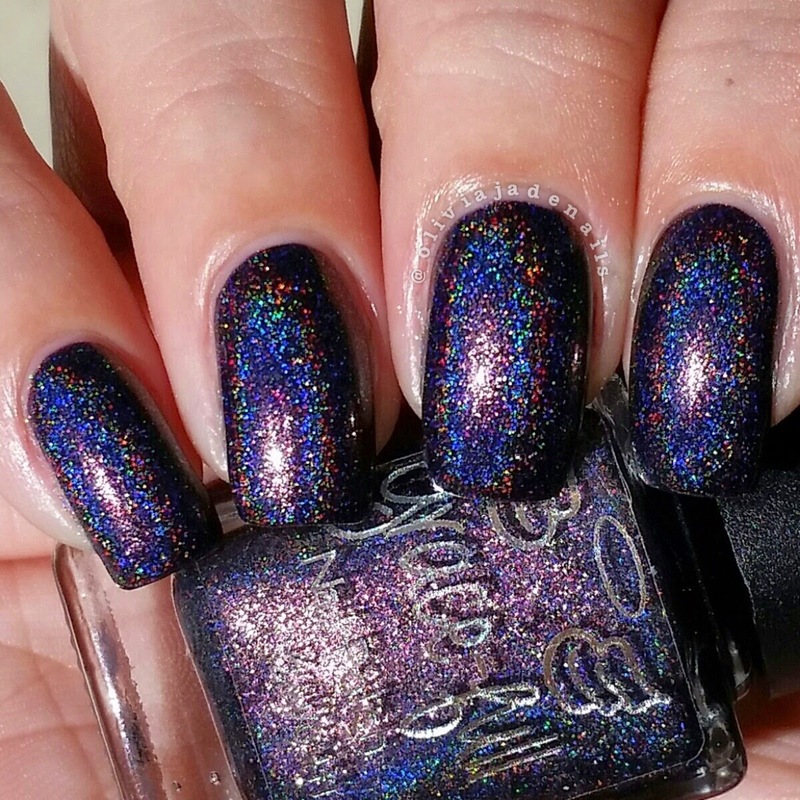 Sea Of Fog is described as a byzantium purple holographic polish. Gorgeous! 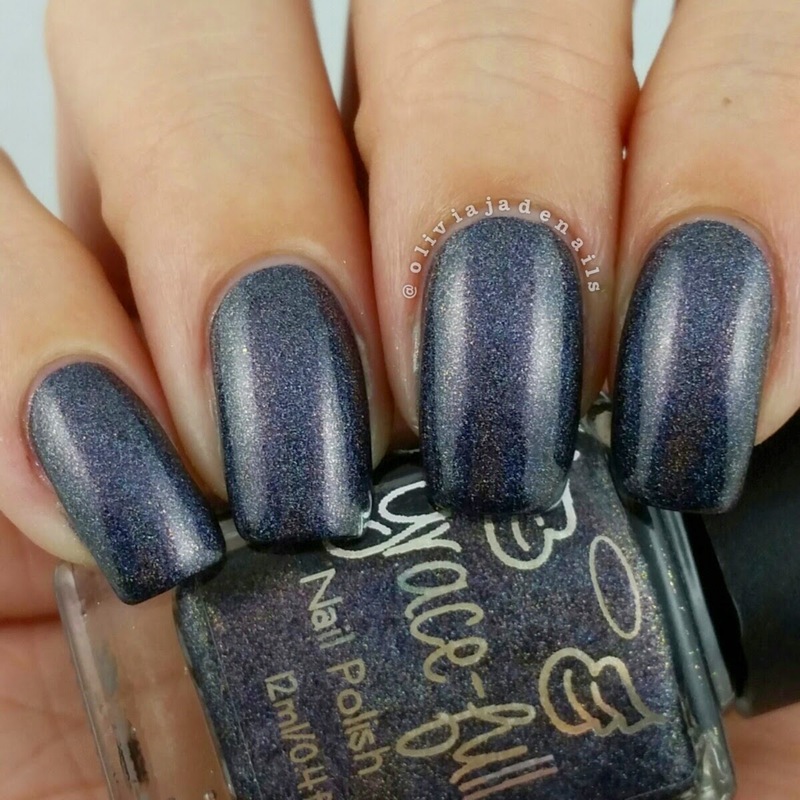 Storm Brewing is described as a gorgeous charcoal purple with striking flakies and a holographic finish. Love, love, love. 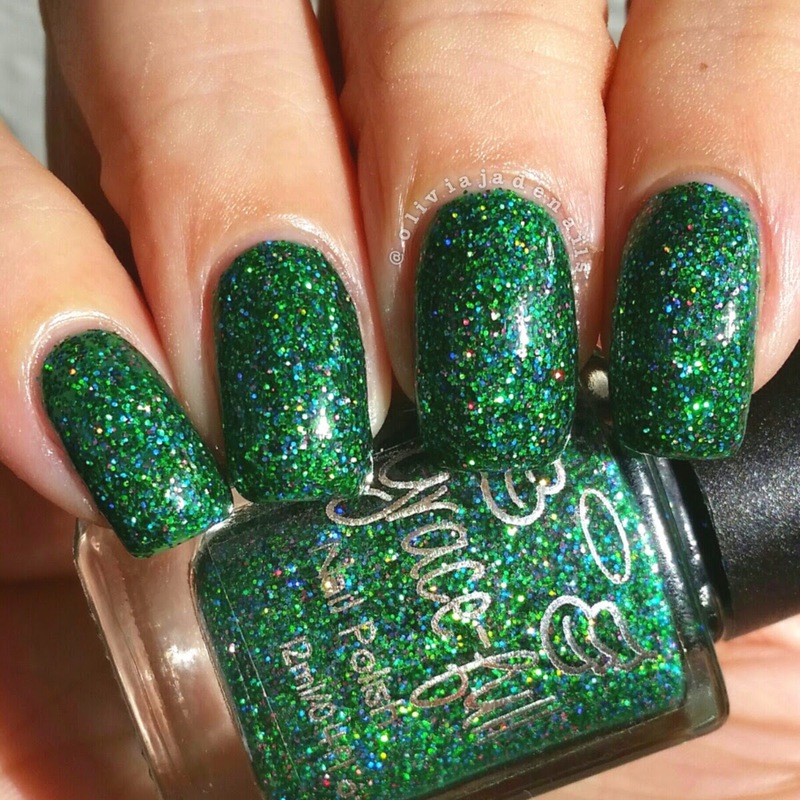 The Sublime is described as a delicious lime nail polish with different shades of holographic glitters and shimmer. I absolutely love this collaboration collection. My favorites would have to be Equinox and Storming Brewing. Both of them I didn't want to take off after swatching them. I know I will be needing to grab full sized bottles of this collection. 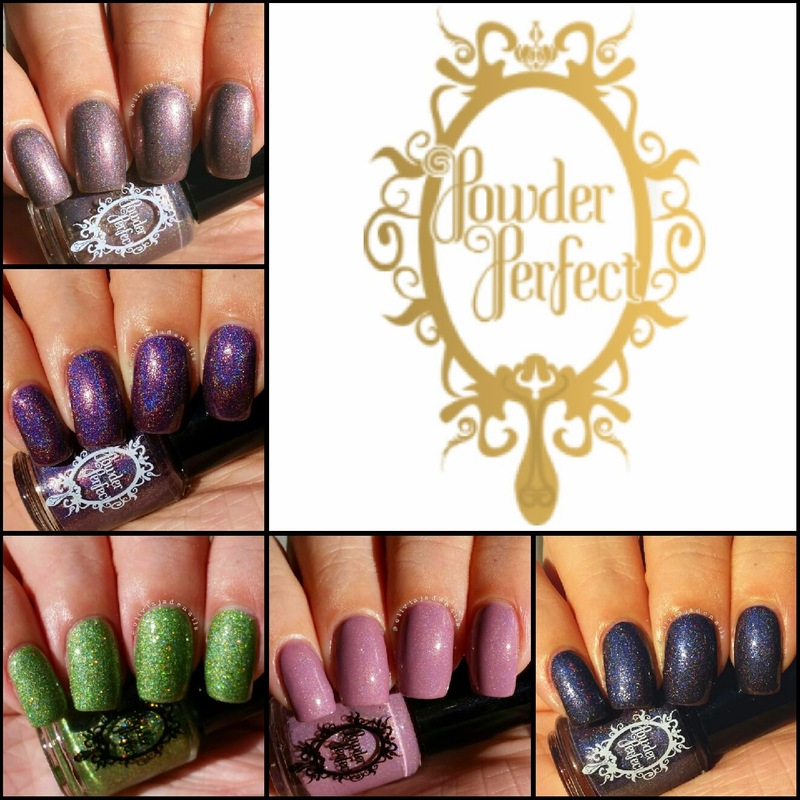 This collection will be available on Friday 29th May from Powder Perfect and Live Love Polish. Don't forget that this collection is limited edition so get in quick. 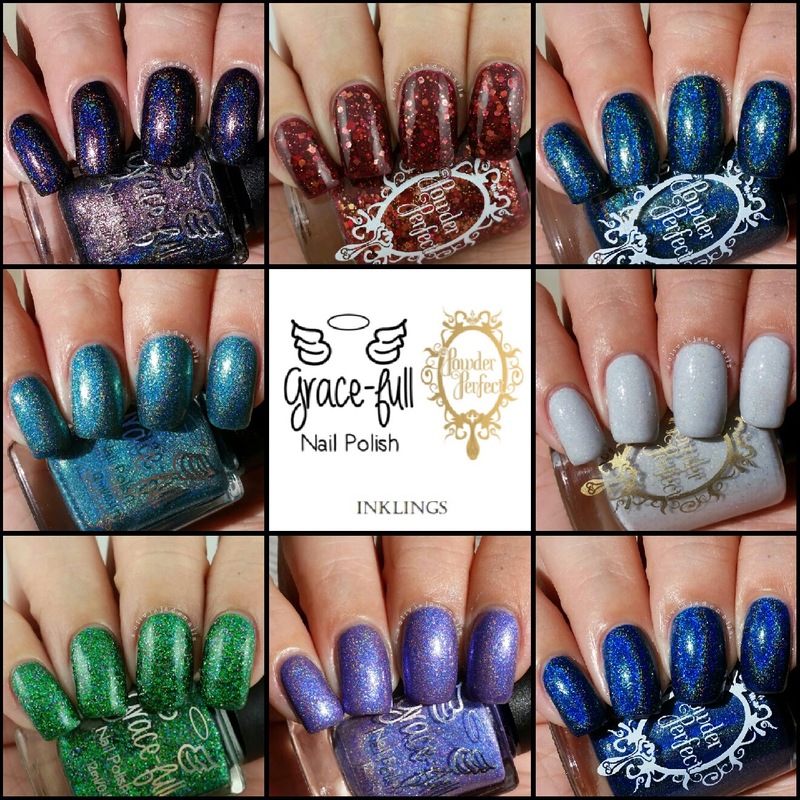 Grace-Full Nail Polish and Powder Perfect have joined together and have created the Inklings Collection which is inspired by a literary mythical universe by J. R. R. Tolkein. I am not actually familiar with the works of J. R. R. Tolkein but I do know pretty polishes, and this collection is full of them. There is eight polishes in total (four from each creator) so let's just get straight into them. First up are the polishes from Grace-Full Nail Polish. 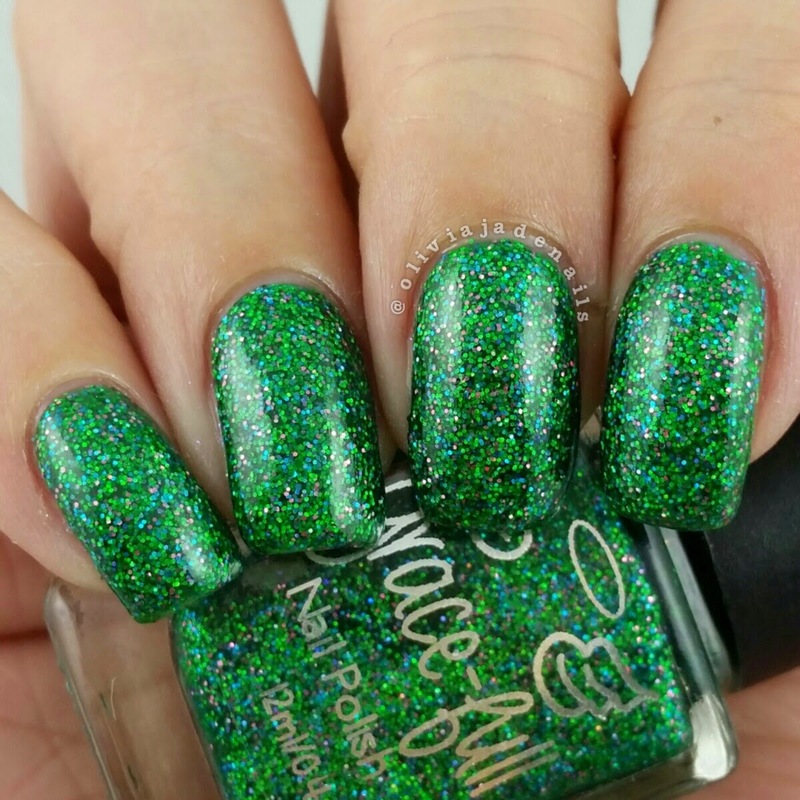 Lights In The Party Tree is described as a bright green microglitter ful of holographic glitters with a green jelly base. There are pink, purple and blue microglitters throughout to represent the hobbit hold doors and the flowers covering the hills. The formula is really easy to use and only requires two coats to be opaque. I also used two coats of top coat to give it a perfectly smooth finish. Mount Fang is described as a deep charcoal linear holo which shifts from red to gold. The red represents the evil within the tower from Saruman's relationship Sauron. The gold represents the power of The One Ring. The formula is fantastic and easy to use. I used two coats for my swatches. 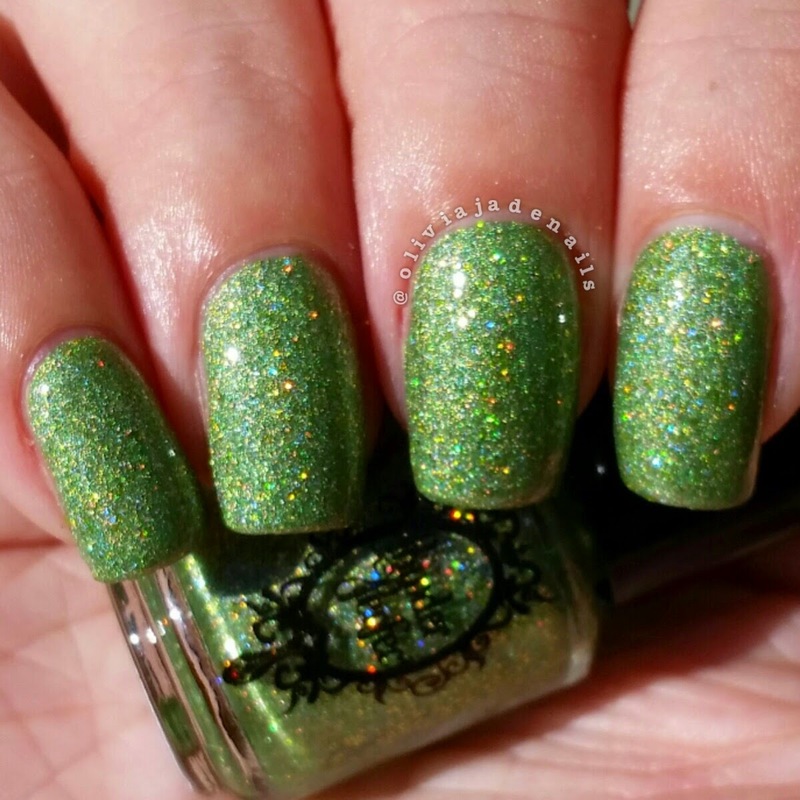 Sunlight And Starlight is described as a linear holo that shifts between blue and green and is based on the elven kingdom Lothlorien. 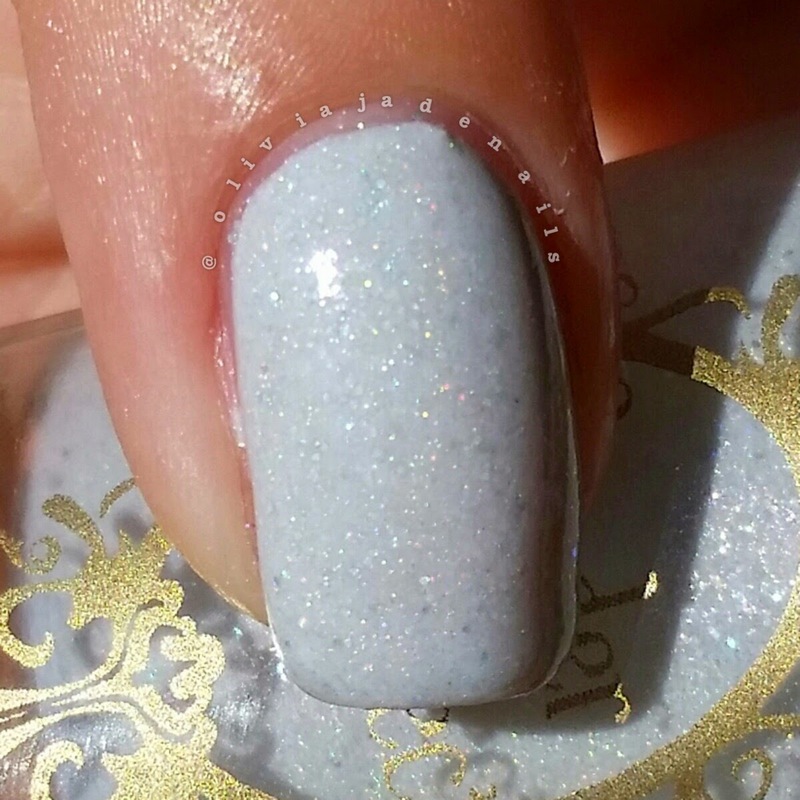 The formula of this one is easy to use and required three coats to be opaque. Where The Gods Dwell is described as a linear holo that shifts from a periwinkly blue to violet and has sparks of pink and blue. 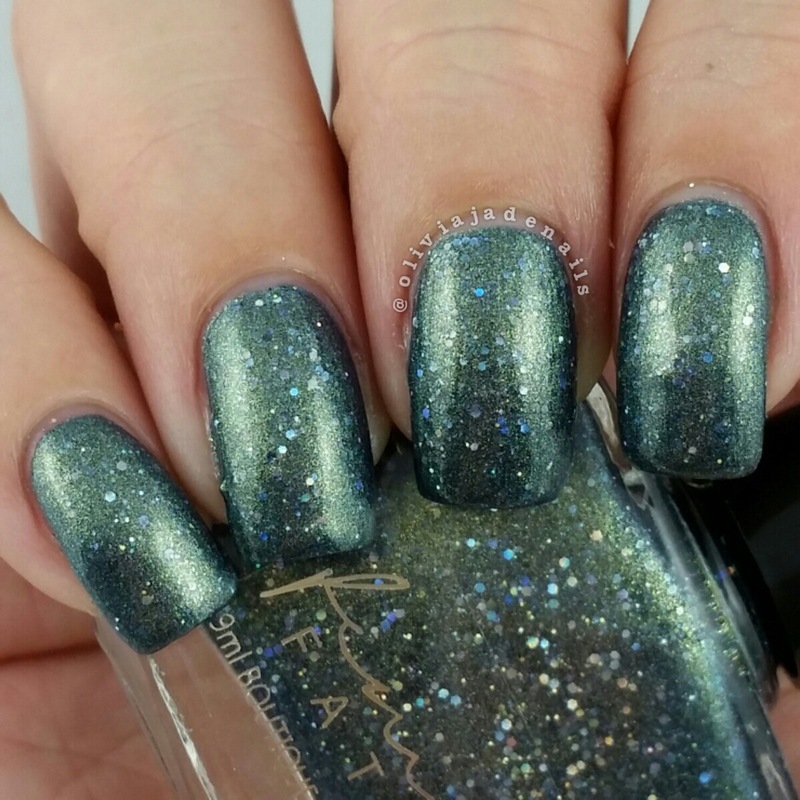 This polish is based on the place Valinor. 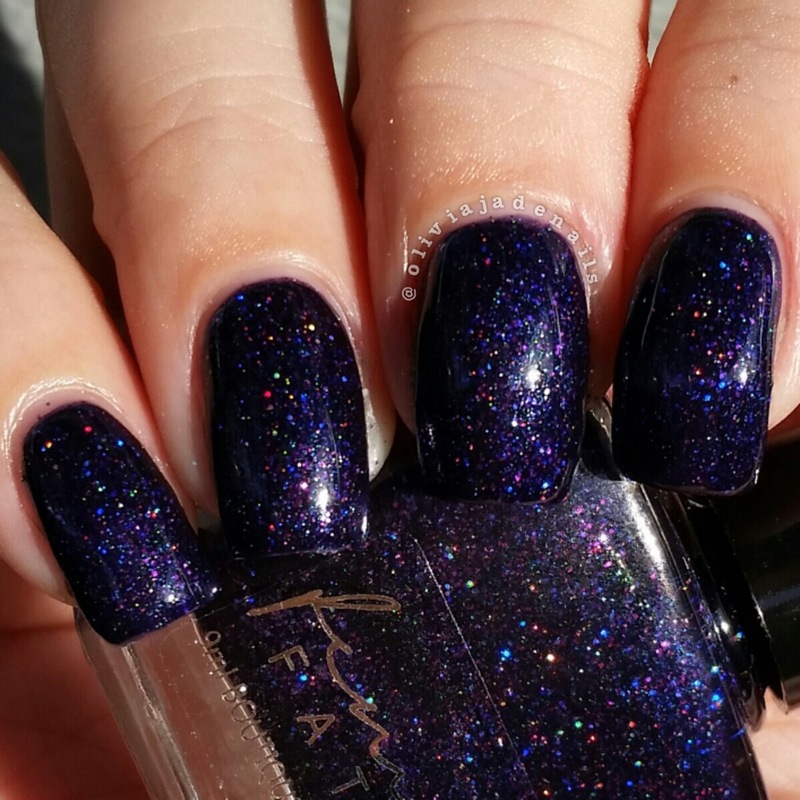 The formula is fantastic and requires two coats to be opaque. 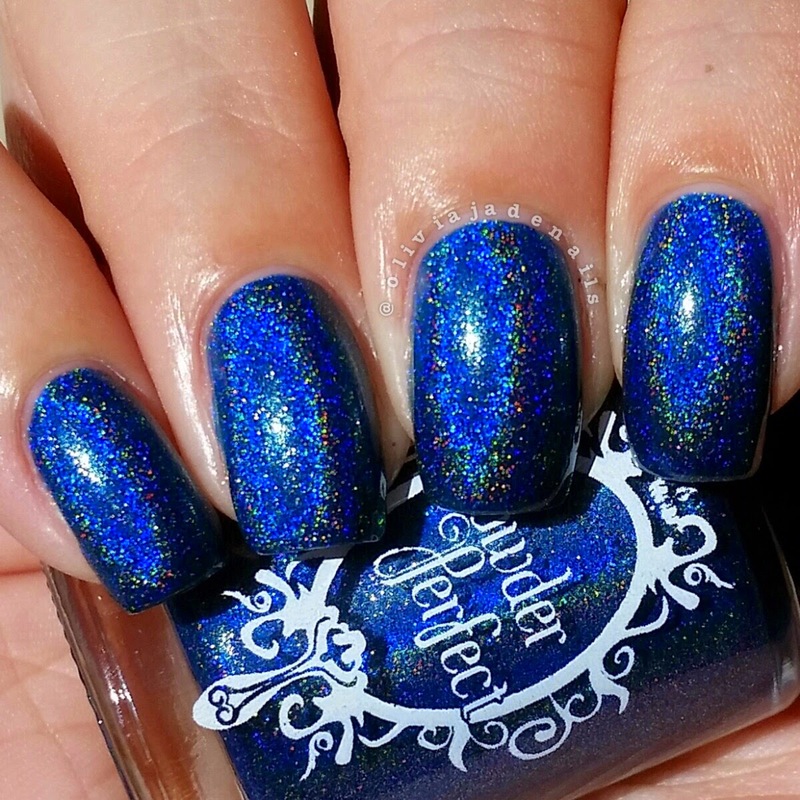 And now the polishes created by Powder Perfect. 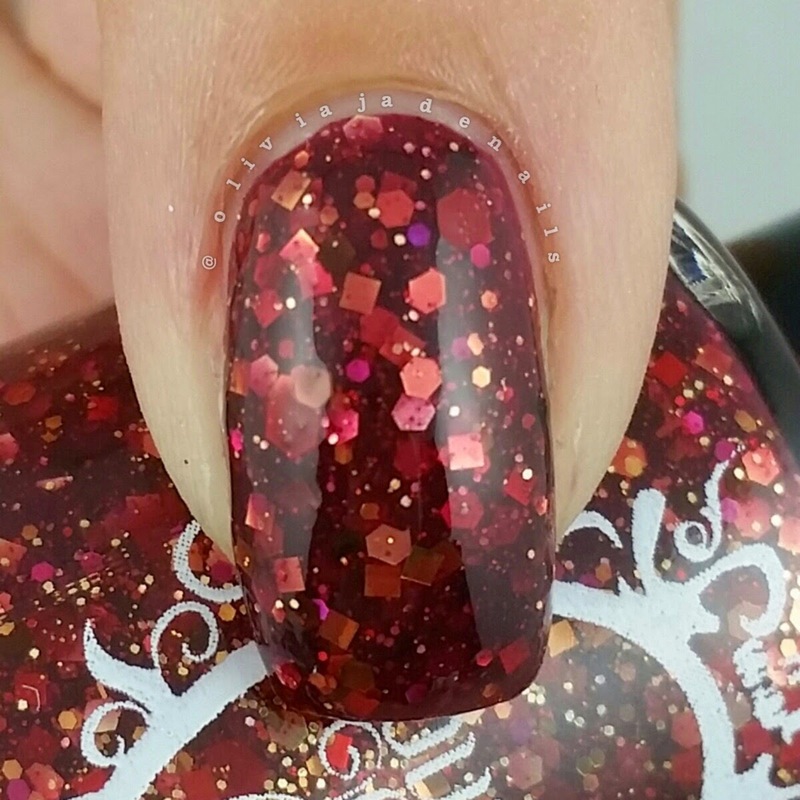 Horse-Lords is described as a maroon jelly glitter with accents of gold and bronze, representing the armour of the Rohirrim. 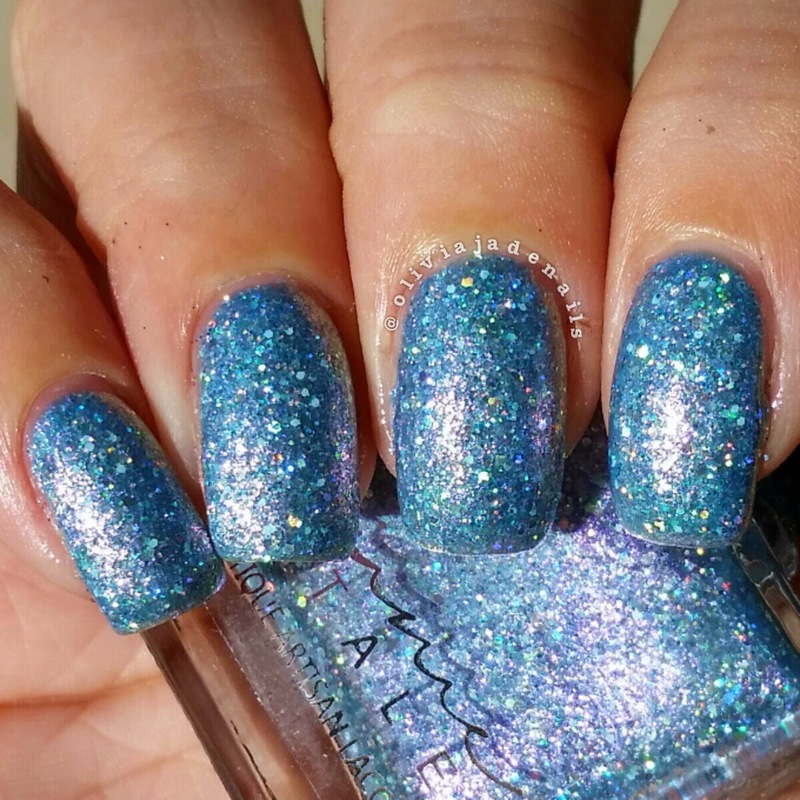 The formula is great, it's easy to use and has a great glitter payoff. I used two coats for my swatch. 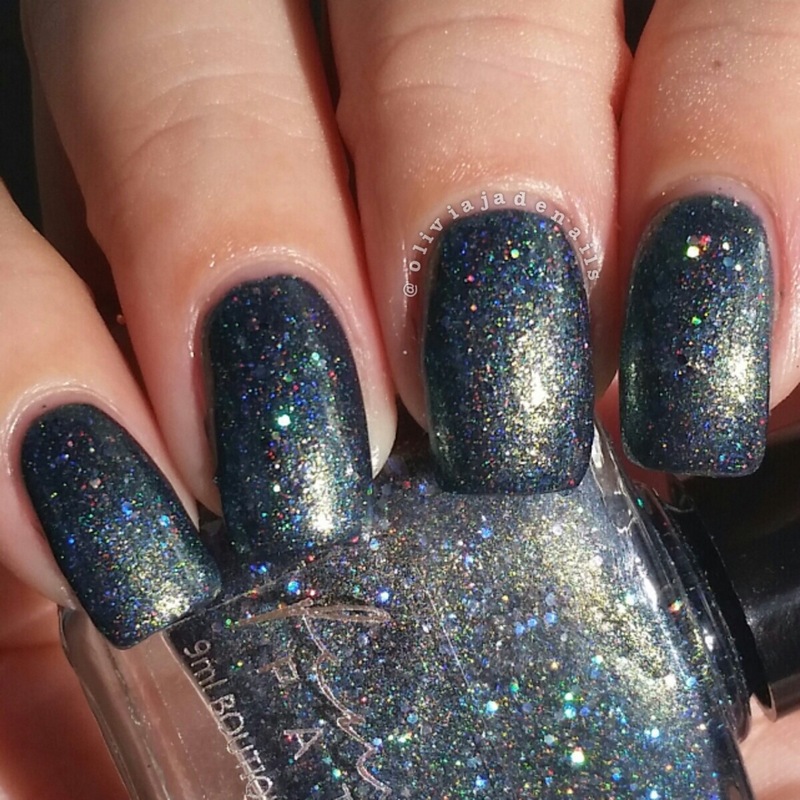 King Of Carven Stone is described as a holographic polish with shadows of deep teal and seams of ultra-chrome green and gold flakies. 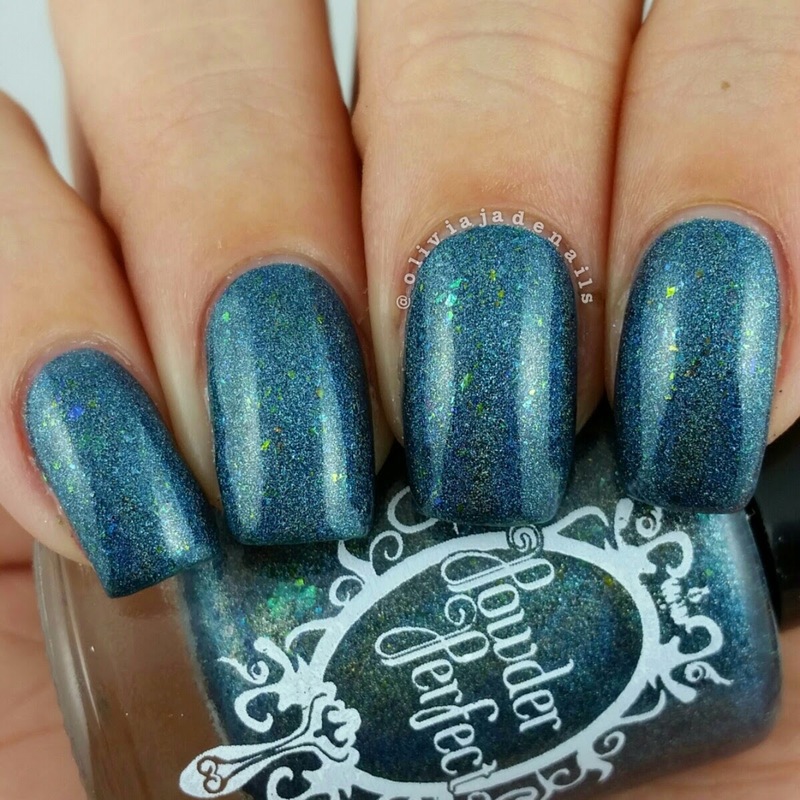 This multi-faceted polish was inspired by the splendour of Erebor, the dwarf kingdom within the Lonely Mountain. The formula is fantastic and close to being a one coater. I used two coats for my swatch. 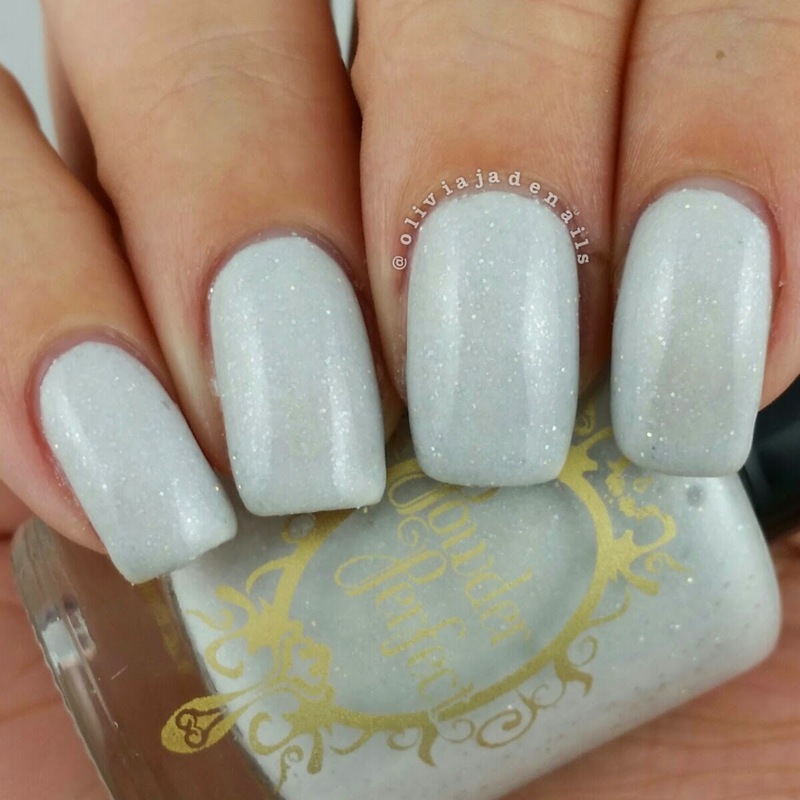 Sacred Light is described as a shimmering grey crelly with holographic particles, glitters and flakies. 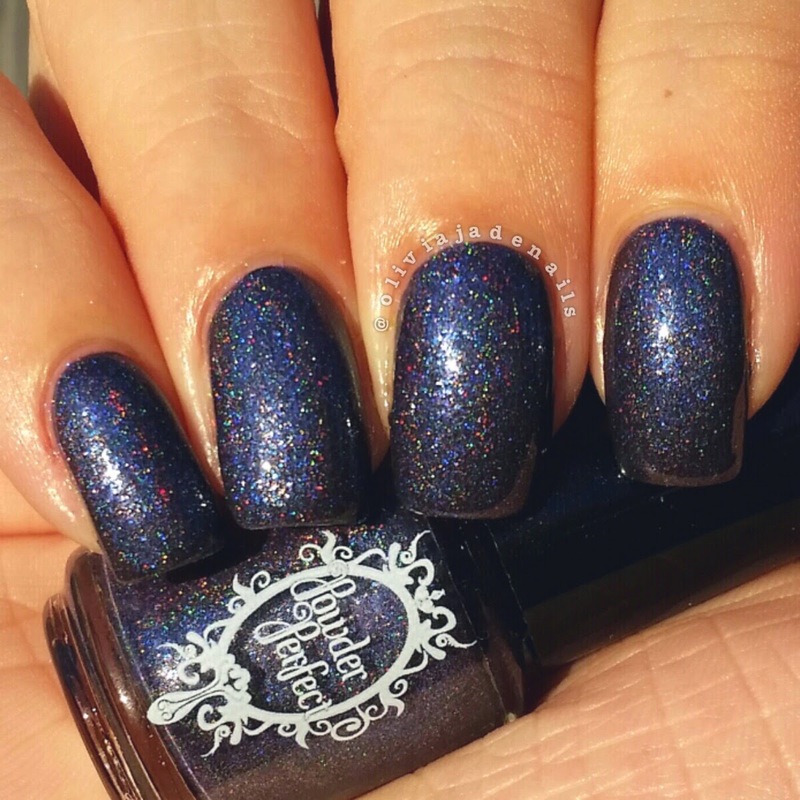 This polish represents the scared starlight that is precious to the elves of the Woodland Realm. Now it is recommended that you use three thin coats with adequate dry time. I didn't actually know this at the time of swatching, and am happy to report that in two coats the polish was opaque. I didn't use overly thick coats either and had no issues with the dry time. Now this polish is actually a lot prettier in real life than my pics. Sacred Light is a little camera shy. 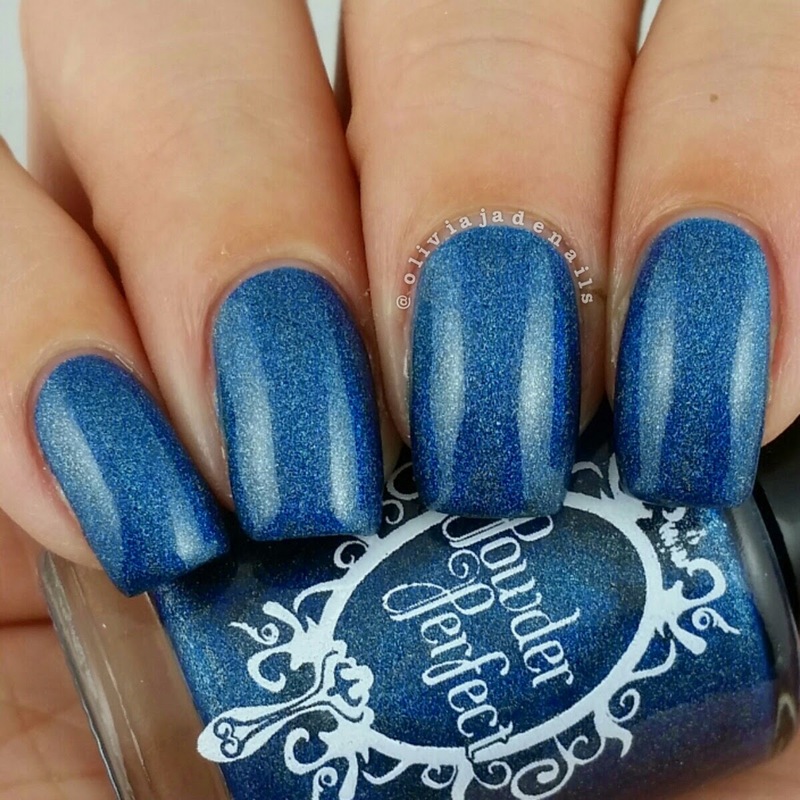 The Citadel is described as a rich navy holographic polish representing the flag of Gondor. The formula is fantastic and nearly is a one coater. I used two coats for my swatch. How pretty is this entirely collection? I am in love. My favorites in the collection are (and in no particular order either) Horse-Lords and The Citadel by Powder Perfect and Where The Gods Dwell and Mount Fang by Grace-Full Nail Polish. 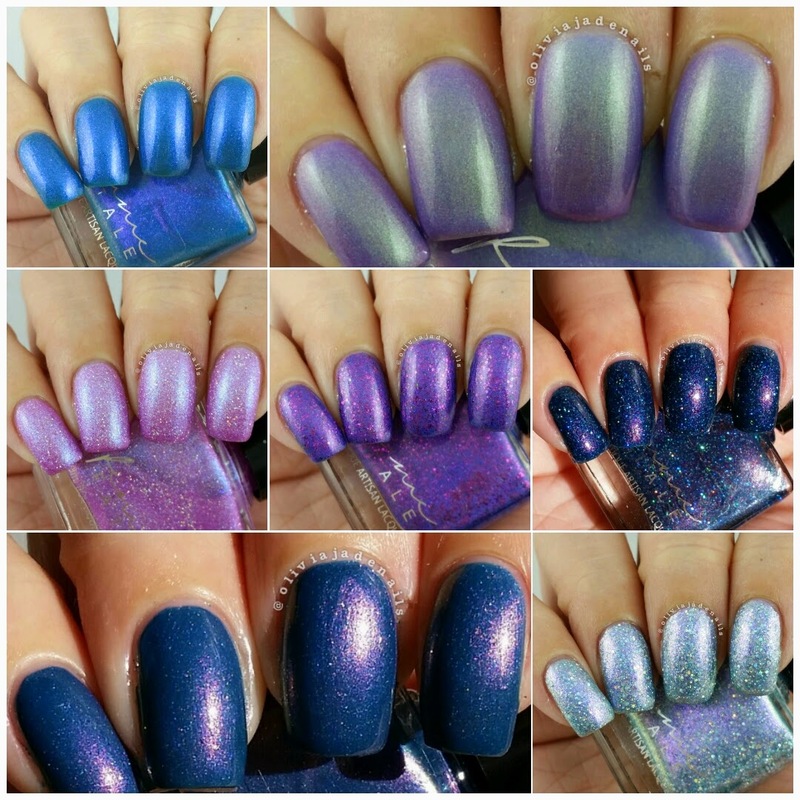 Which of the polishes in this collection are you loving? These polishes are available for pre-sale starting on Friday 29th and will be available from Grace-Full Nail Polish and Powder Perfect. 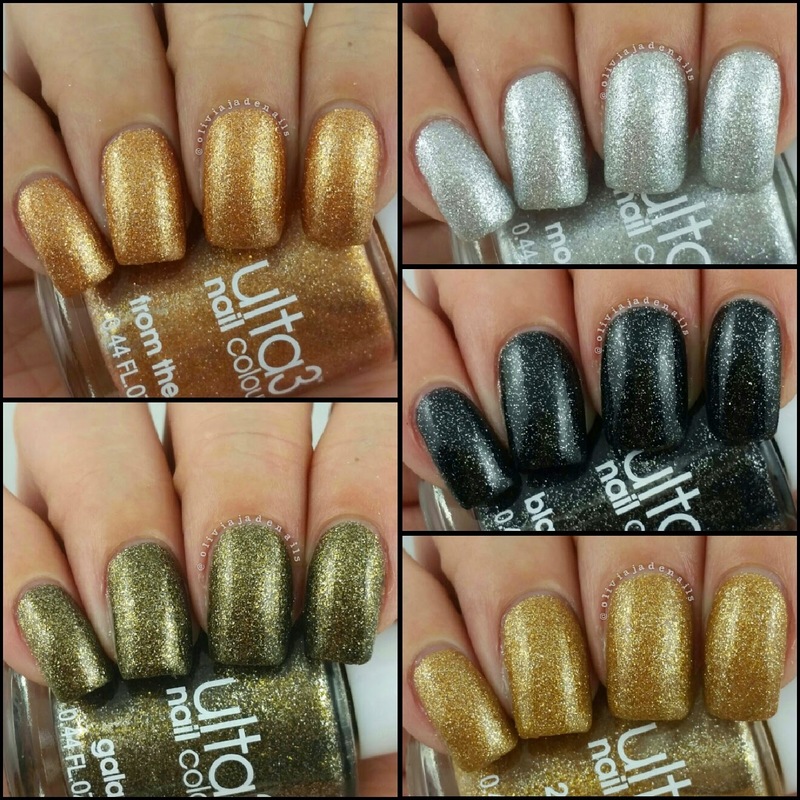 Today I am excited to share with you the recently released Autumn/Winter Metallic Collection from Ulta3. I have seen a couple of people mention that these are a textured collection, but I haven't seen any marketing from Ulta3 that says that they are meant to be textured, only metallics. That being said, these can be worn as a textured polish if you desire but I don't find that they give the same textured look or gritty feeling as an OPI Liquid Sand (they are the only textured polishes I have tried so it's all I can compare it too). The formulas of this collection I found are really easy to work with and either need two or three coats to be opaque. I did find that they were quite slow drying which was a bit of a surprise for me. Normally I find the fine glitters dry a lot quicker. 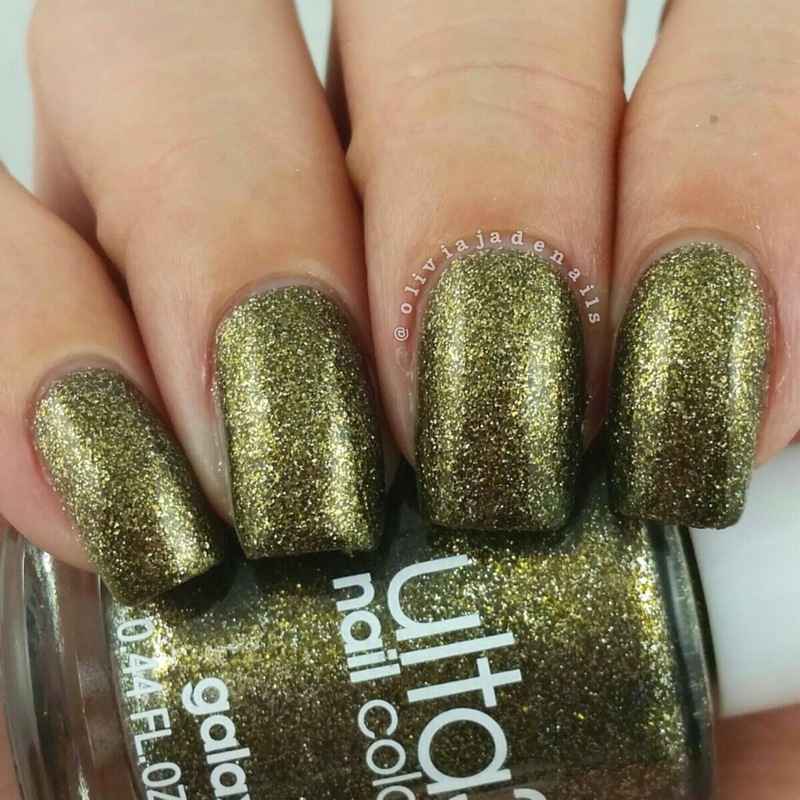 24 Carat Gold is a clear based polish that is filled with gold and silver microglitters. Really pretty and sparkly. 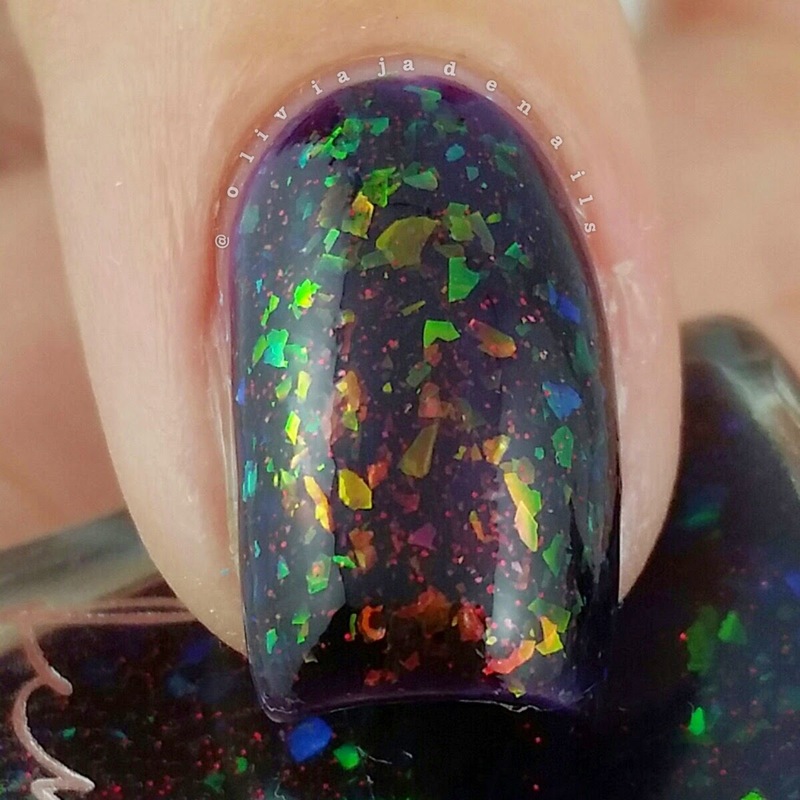 I think this would look pretty layered over other polishes too. I used three coats for my swatch. 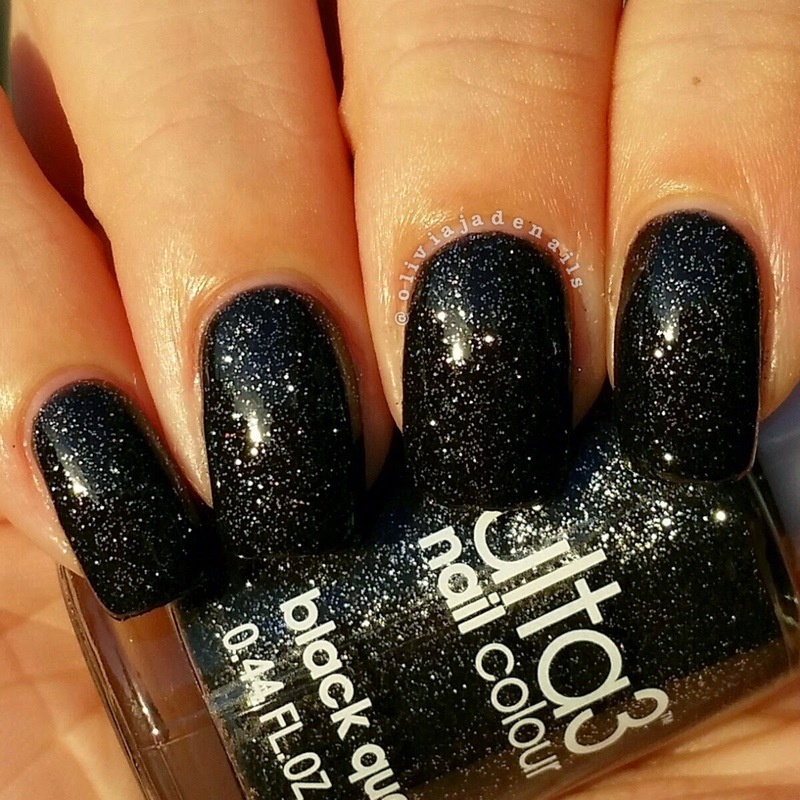 Black Quartz is a black based polish with fine silver glitters. 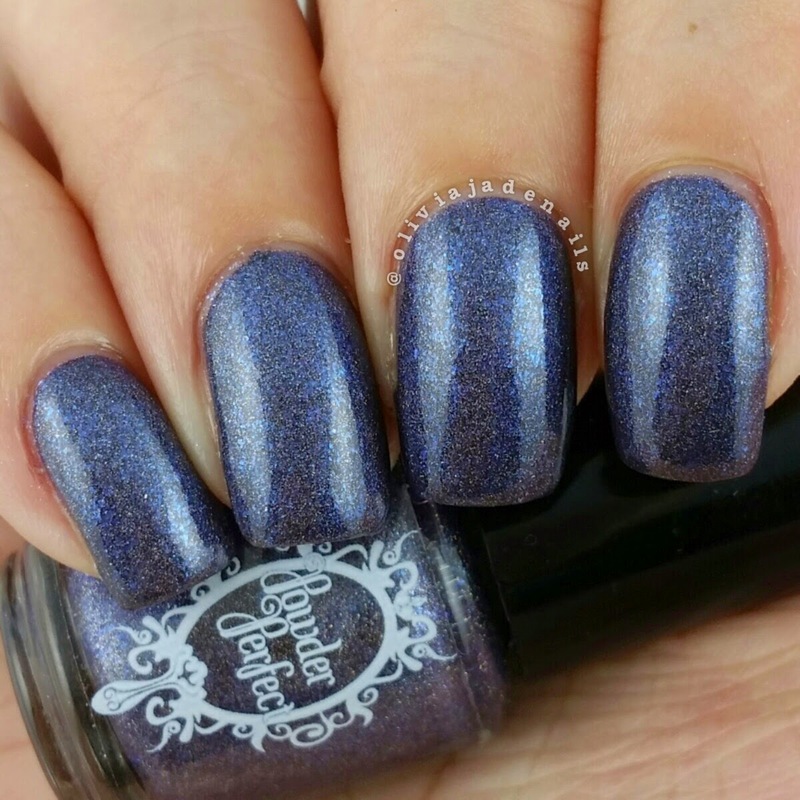 This polish dries quicker than some of the others in the collection and is opaque in two coats. From The Mine is a clear based with copper, gold and silver microglitters. 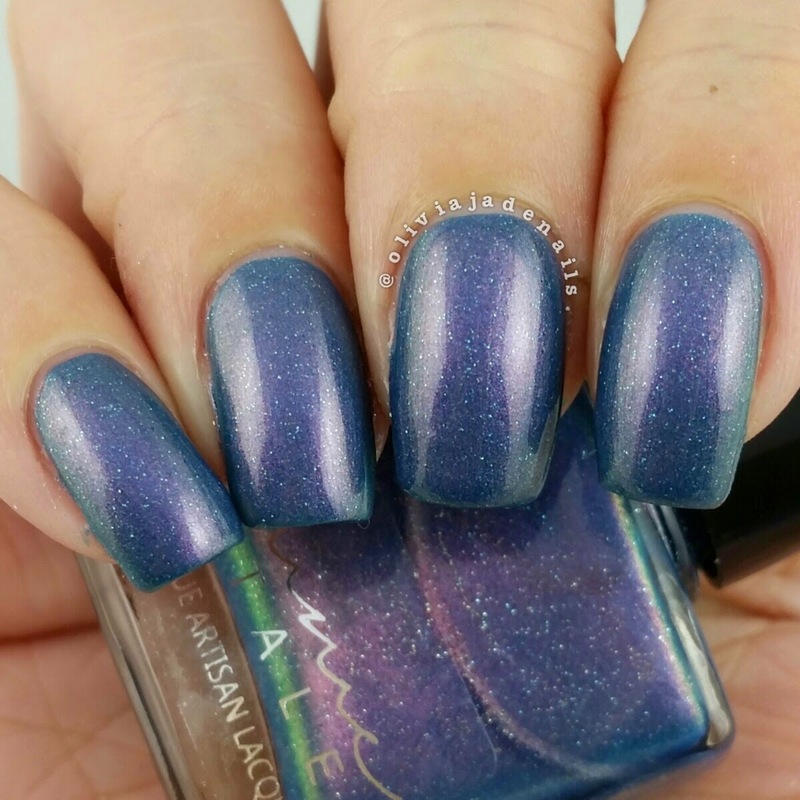 This polish is definitely unique in my collection. I found that this one also didn't dry as slow as other in this collection, but it was still slower to dry than Black Quartz. I used three coats for my swatch. 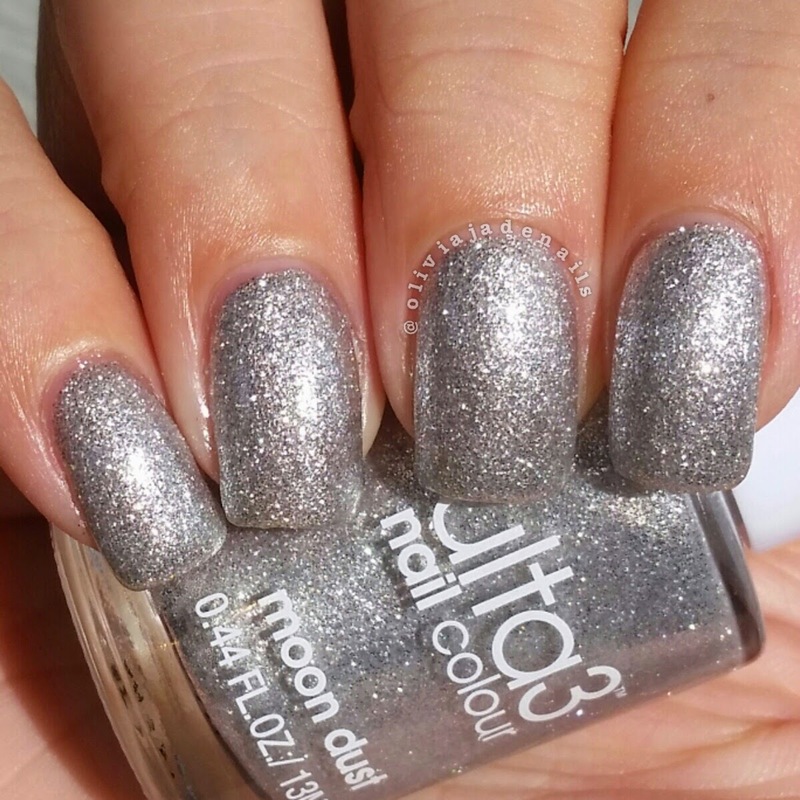 Galaxy is a grey based polish with gold and silver microglitters. The mix of colours give it kind of a greenish look to it. It's really pretty and quite unique in my collection. This one also appears to dry the quickest of the collection. I used two coats for my swatch. 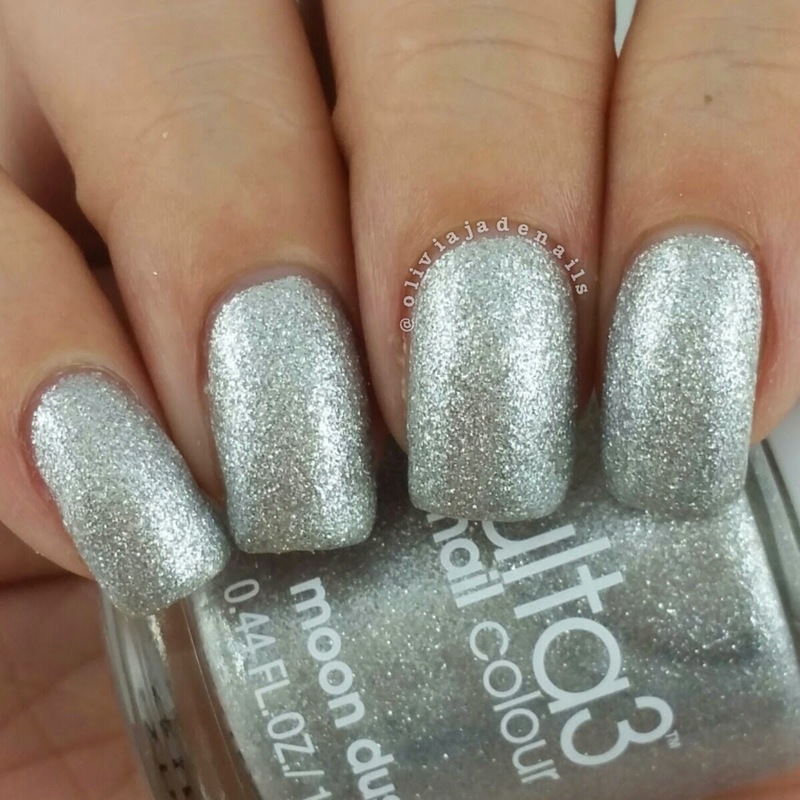 Moon Dust is a clear bases polish with silver microglitters. Super pretty and sparkly, but really slow drying. I used three coats for my swatch. I quite like this collection of polishes. 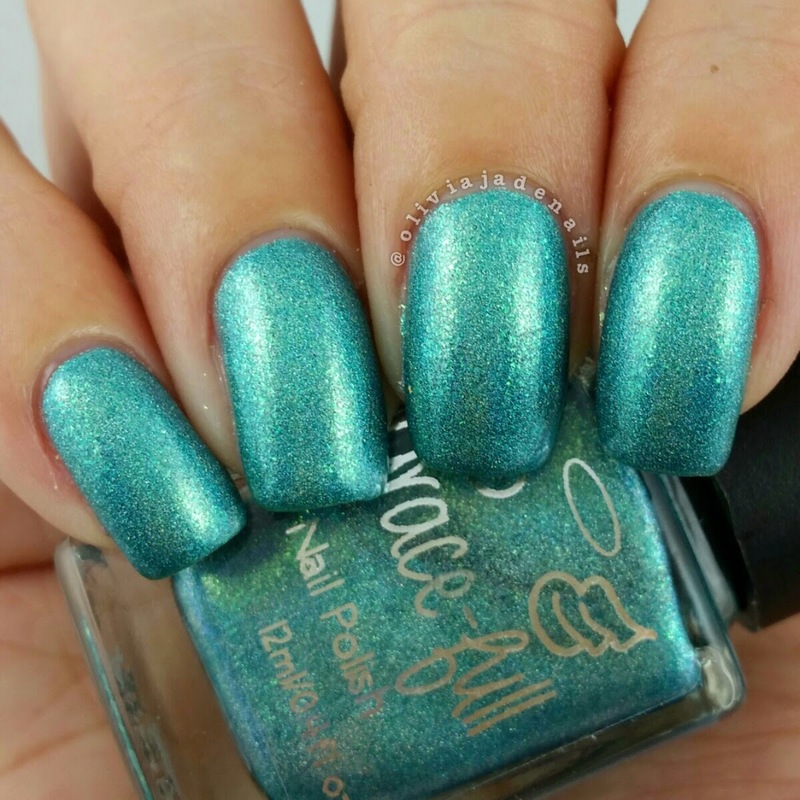 It is particularly great for those starting there polish collections seems they are at such an affordable price (RRP $3). 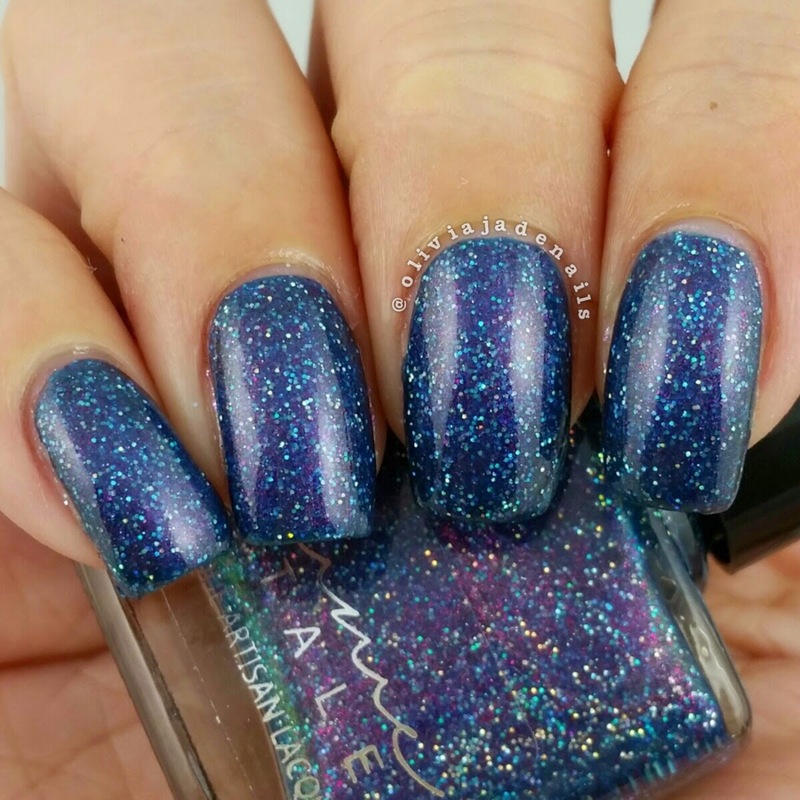 My absolute favorite is Galaxy from this collection. Ulta3 is available from local chemists and pharmacies. You can find your nearest stockist here. 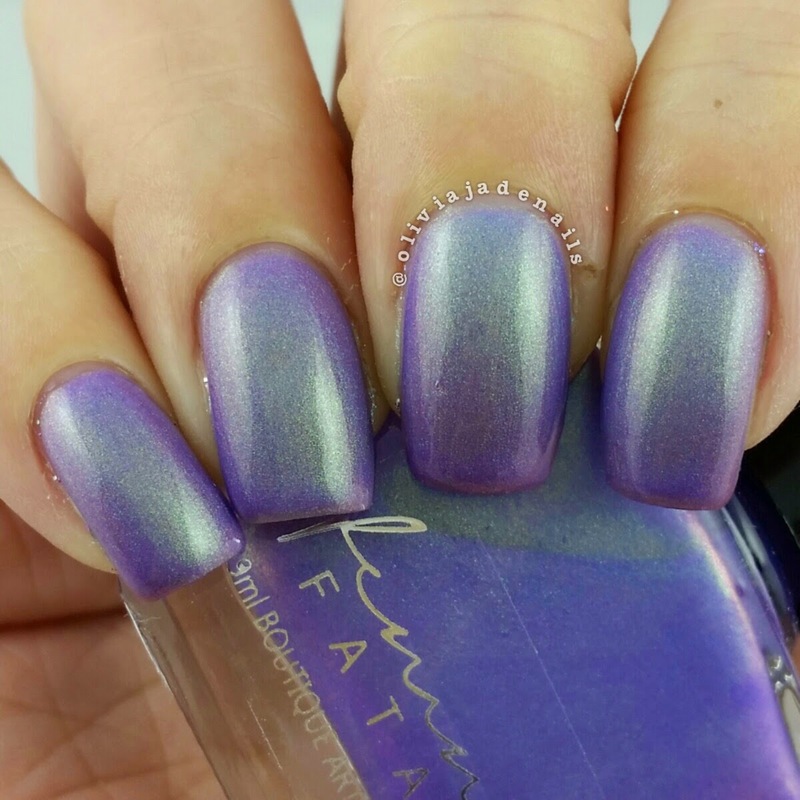 I can't believe it's nearly the end of May and I am only just getting around to posting the April releases from Femme Fatale. Ahhhh!! I blame moving and a lack of sunshine when I was in Melbourne. I did manage to post the Colour Of The Month back in April (you can see that post here) so that was a good start. 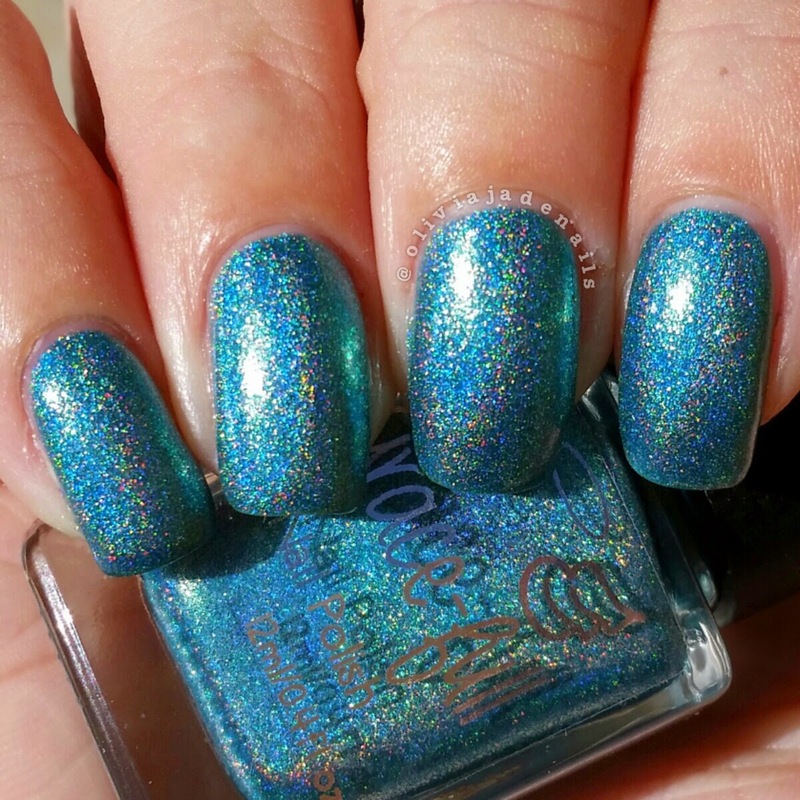 Anyway today I am sharing the seven other polishes that were released in April. 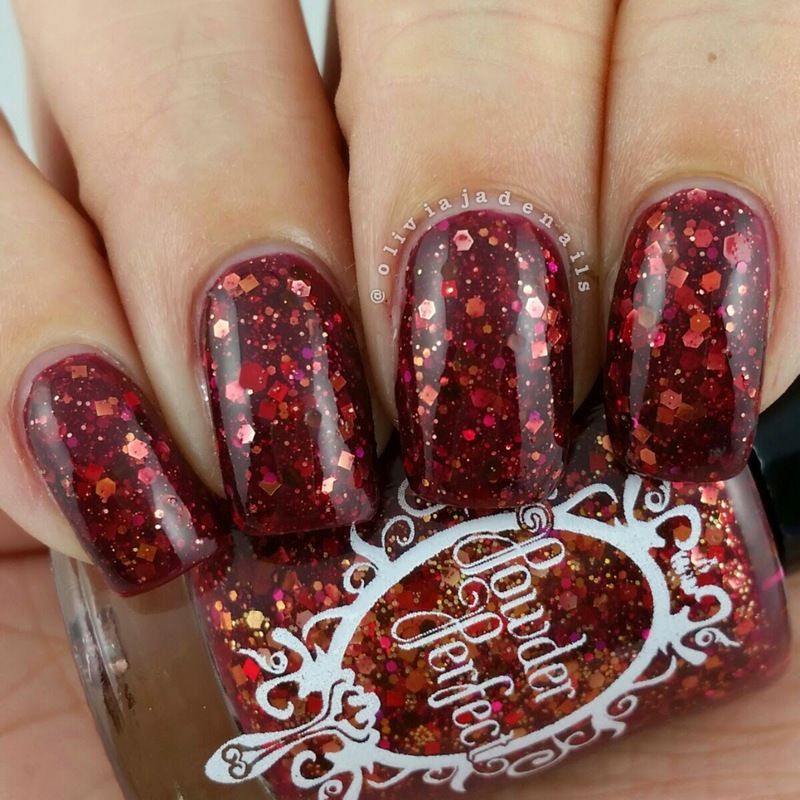 These polishes are loosely inspired by Brother's Grimm Snow White. 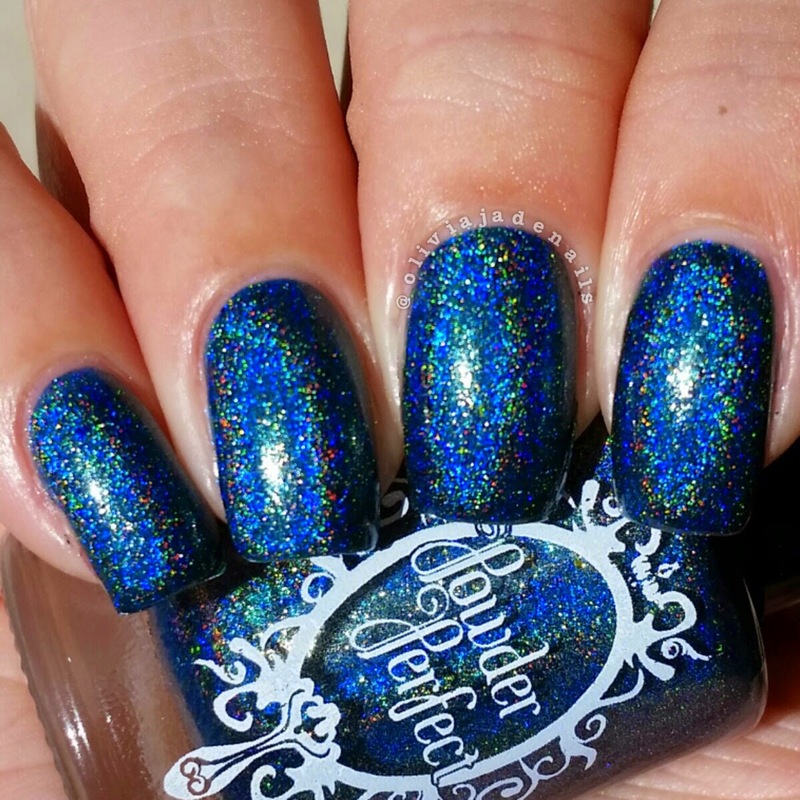 Art Of Witchcraft is described as a teal jelly with red shimmer, teal and maroon microglitters plus more! This polish applied easily and only required two coats to be opaque. 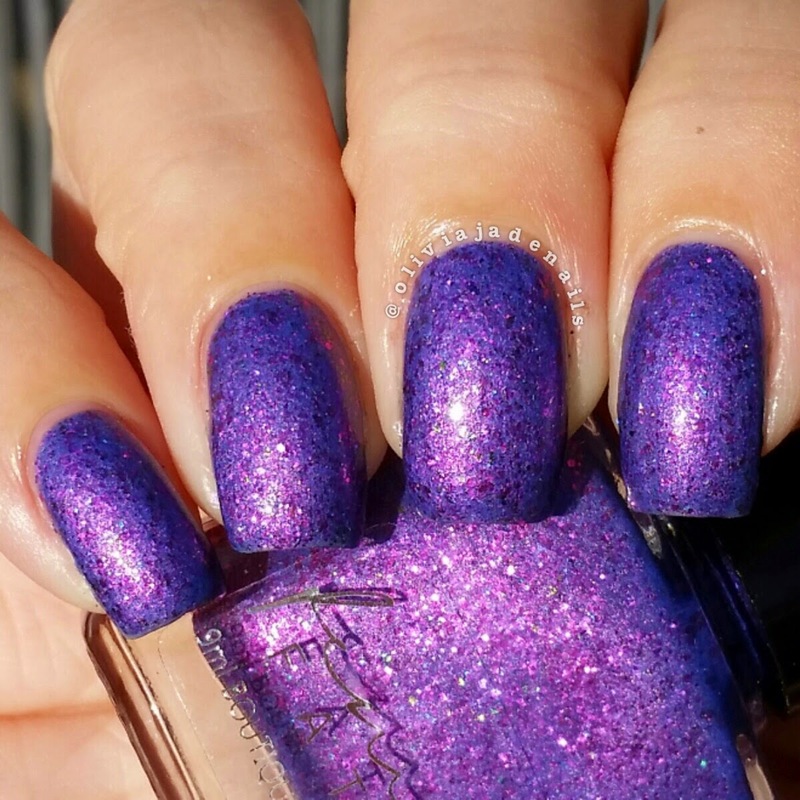 Bodice Lace is a rich bright purple with fuchsia microglitter, pink shimmer and multicoloured metallic flakies. 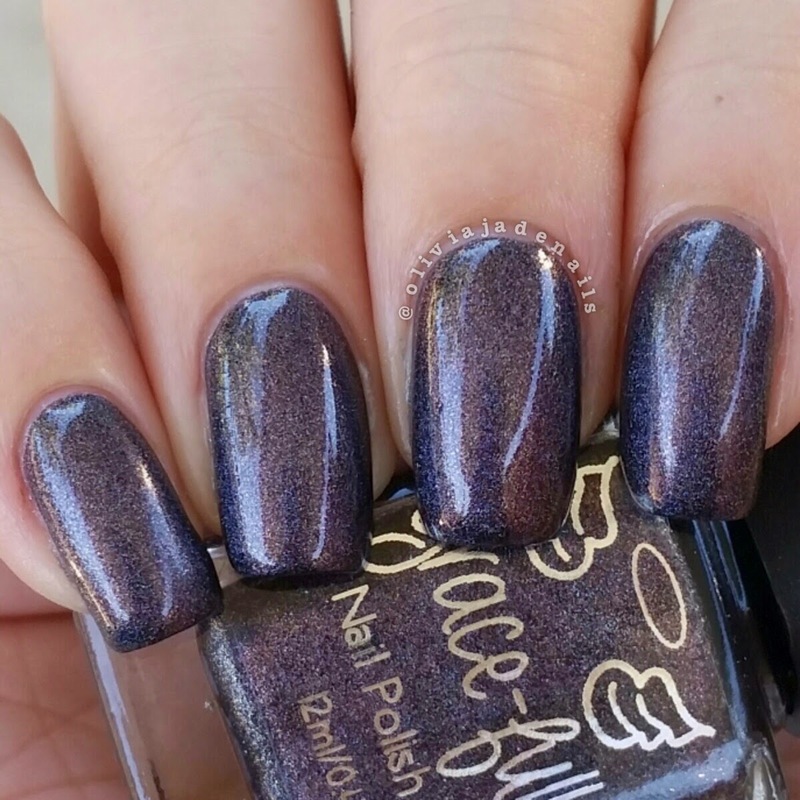 This polish screams my name. I absolutely love it and the formula is great too. I used two coats for my swatches. 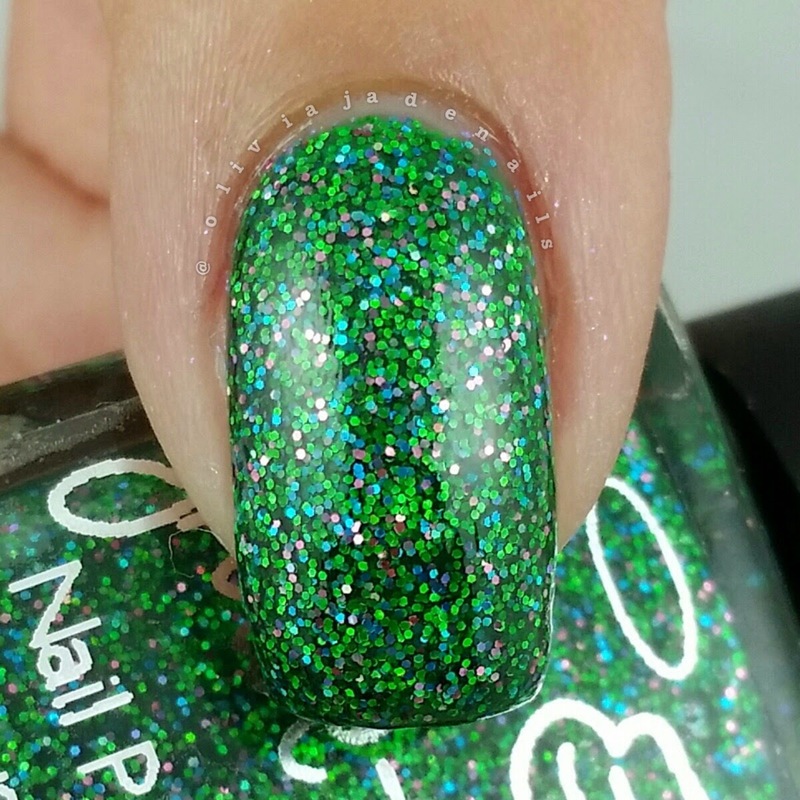 Glass Coffin is a thermal polish with a green shine. 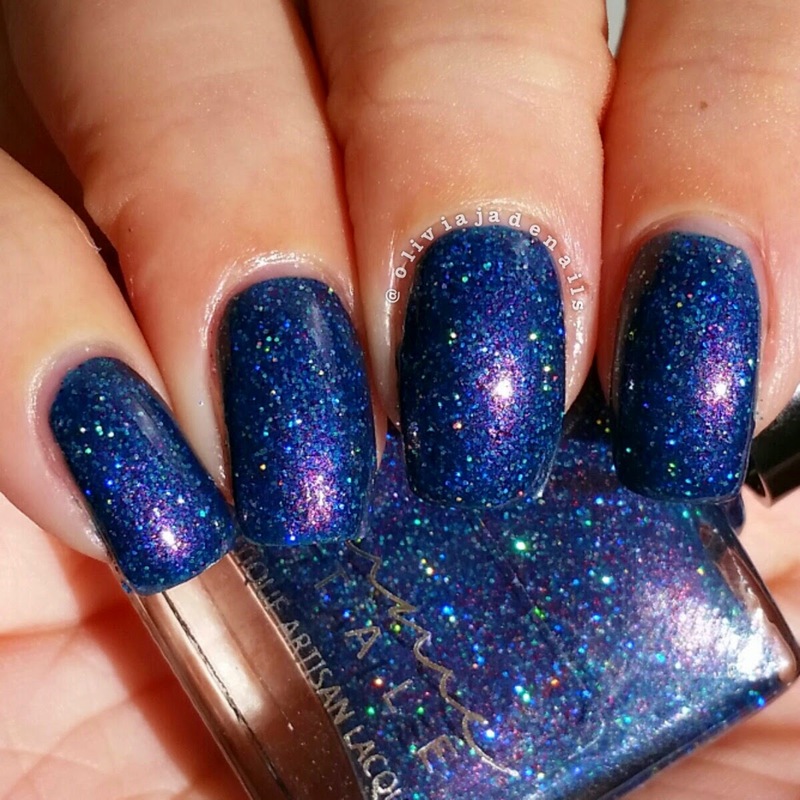 This polishes changes from purple (in its cool state) to blue (in warm start). The formula was easy to use and requires three coats to be opaque. Mirror, Mirror, On The Wall is a seafoam blue with a strong pink shimmer and silver holographic microglitters. 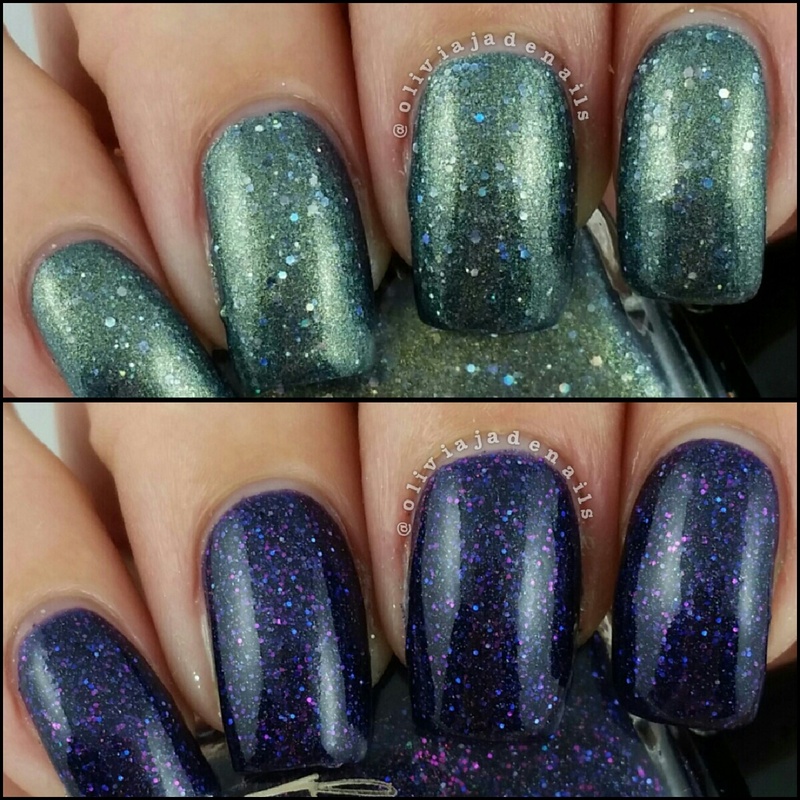 Again, formula is super easy to use and only requires two coats to be opaque. Poisoned Apple is a washed out dark teal-green with red overlay and silver sparks. The formula is easy to use and only requires to be two coats to be opaque. Weed In Her Heart is a sheer teal-green jelly with vibrant purple shimmers. I used four coats for my swatch and find that there is a slight visible nail line, so next time I would definitely use a base colour. The formula is easy to use. Who Is The Fairest Of Them All? 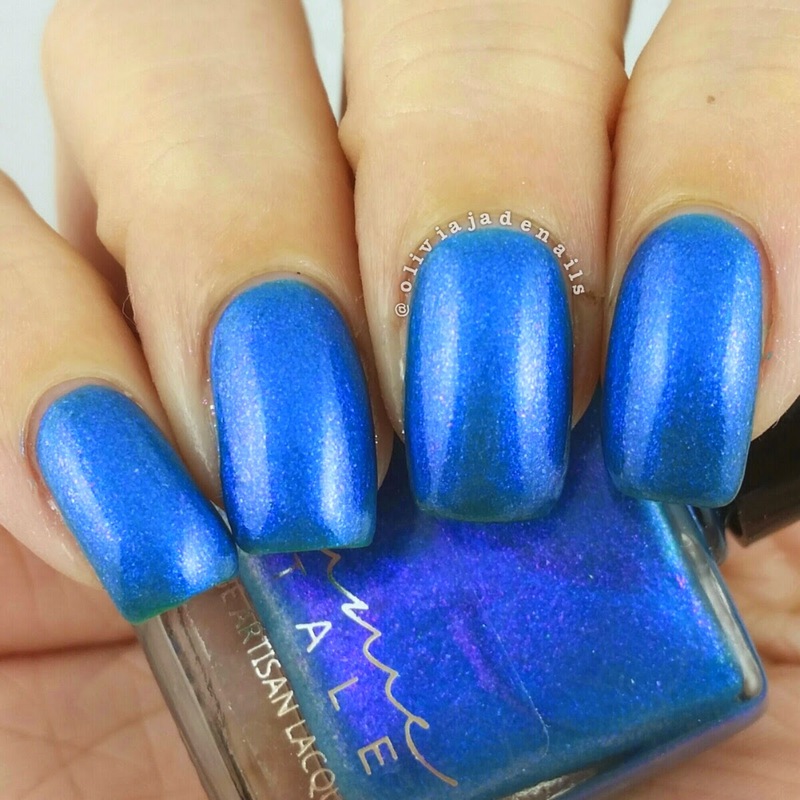 is the other thermal polish from this release. 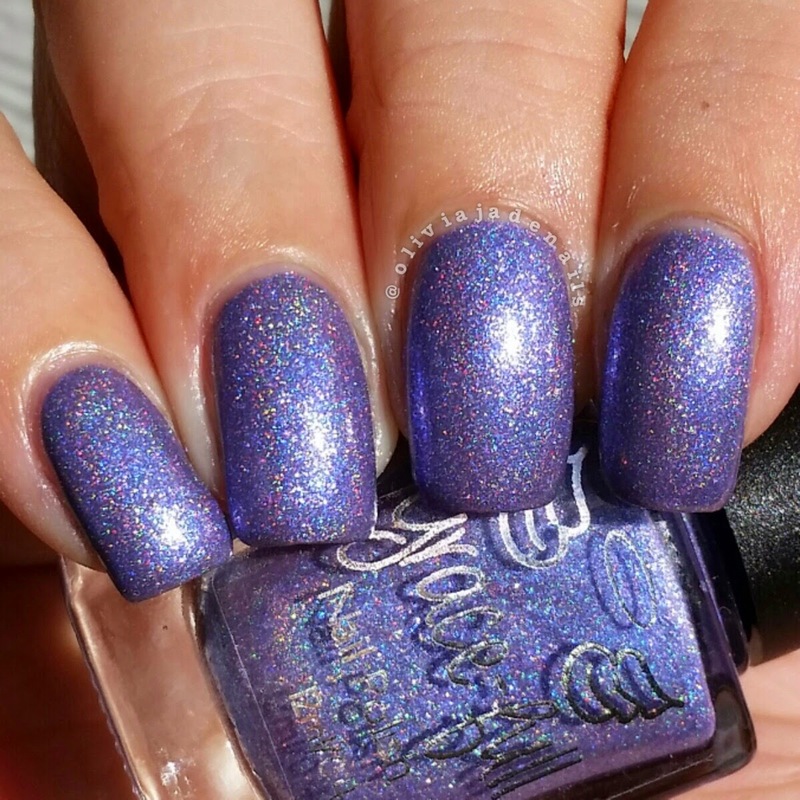 This polish changes from pink (in its cold state) to purple (in its warm state) and has a strong blue shimmer and silver holographic microglitters. The formula is easy to use and requires three coats to be opaque. I like this collection, the colours are all beautiful, although I feel like there wasn't a huge colour range. My favorites are definitely Bodice Lace, Mirror Mirror and Who Is The Fairest Of Them All?. 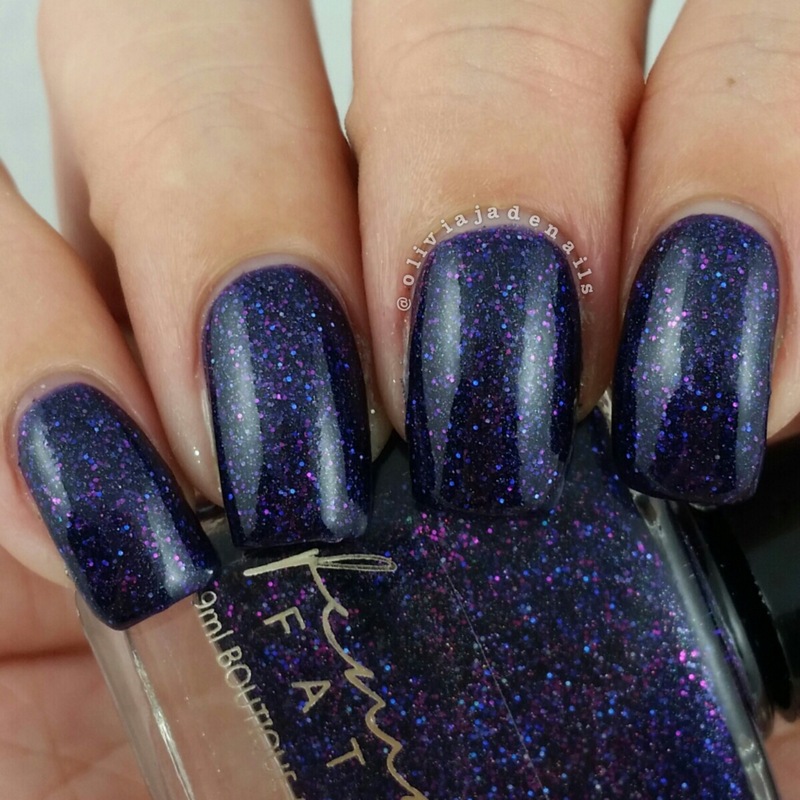 Like with all Femme Fatale releases I am not sure if any of these polishes will be making a comeback (or if they are still available by any of the stockists). You can find the list of stockists on the Femme Fatale site and you can keep up to date with all pre sales via their facebook group.